For the baseline question, Angel, how long is your daily commute? About 2.5 – 3 hours total, up from the 0.5 hours total it used to be with my old job. Wow, that’s quite the journey! Throughout it, what are the different types of transportation you take to get to work? A combination of Mobike (shared bicycles), the subway and … walking. In Beijing, there is housing all over, including closer to where you work. Why do you choose to have such a long commute instead of just moving closer? At first, it was sheer optimism. “It can’t be that bad,” I thought. As it turns out, it unfortunately is that bad. At this point, it has come down to deciding that being close to my friends and the church – never having to worry about the last subway home and expensive cab fares – is worth the painful daily commute. What do you consider to be the best part of your commute? Having a fixed amount of time each day that I’m forced to set aside for things I likely wouldn’t otherwise have the discipline to carve out time for. What are some of those things you now have time for that you do during your commute? On the flip side, what’s the most difficult part of your commute? Definitely having to deal with the aggression. I’ve come to realize that it isn’t really the length of the commute as much as it is being pushed by and/or having to push through staggering crowds that is truly exhausting. So we’ve talked about the good, the bad, but what about the humorous…What’s the funniest thing you’ve witnessed while on your way to work? Can’t really think of any, really. But I did find it quite amusing that fellow commuters were quite quick to share their nuggets of Beijing subway wisdom whenever my rookie-ness was apparent. You had said that you started commuting with a bit of potentially misplaced optimism…What then do you wish you would’ve known before you started having such a long daily commute? 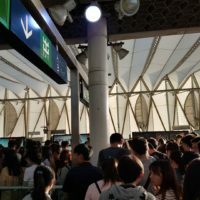 A heads up on the unspoken norms of the Beijing subway would definitely have saved me some grief! While I still struggle with bouts of frustration, once I had a better understanding of the circumstances people were going through and realized that they were not being deliberately rude (in the way I’d usually interpret similar behavior), I felt a lot better. That’s a really helpful perspective change! As a last piece of advice for some of our readers who may be transitioning into a long commute or in the midst of one, what are some things you think people should be prepared for if they’re going to be commuting for long periods of time? The first things that come to mind are how easy it is to (1) get stuck in a cycle of frustration and (2) squander precious time that could be more fruitfully spent. Be purposeful about how you want to spend that time each day, i.e. make a plan and stick to it. And the plan doesn’t have to be about numbers (100 pages a day or I’ve failed as a steward of God’s time!) – it could simply be a commitment to using that time for prayer, or even doing absolutely nothing as a social media/mental detox at the start and end of each work day. Angel, thank you so much for taking the time to share about your life as a commuter! I know it’s proven to be a helpful conversation for me as I’m apartment hunting and considering my own impending commute! Best of luck on your continued journey across Beijing! Do you have questions about commuting? Post in the comments below and we’d love to get back to you!